Over the last ten years in New Jersey, the growth of ethnic and cultural group has increased dramatically. Based on Census 2010 data, 19% of the State of New Jersey can be considered new Americans -a 58% increase since 1990. 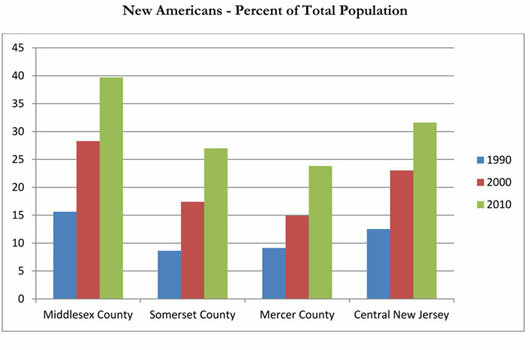 If this trend continues, by the year 2020 almost one in three people are new Americans in Central New Jersey. Since 1990, the state’s Asian American population has increased by 166% and the Latino population has more than doubled (111%). In Middlesex County alone, almost one out of five people are of Latino descent, while another 21% of the total population is of Asian descent. In Mercer County, which has total population of 366,500, the Latino population has reached 15% and the Asian population represents 9%. Similarly, in Somerset County, the Latinos represent 13% and Asians represent 14% of the total population. Arriving to a new country can often feel overwhelming, with no clear sense of where to go. Fortunately, the New Americans program is committed to making certain that no one is left in the dark. Our primary objective is to make every new American more knowledgeable, more capable, and more connected to their new home and those around them. As the immigrant population and their future generations continue to grow, so do the roles and initiatives of the New Americans program. We believe that aggressively reaching out to meet the needs of new Americans is not only our mission, but an absolute imperative for the entire state.. The state of New Jersey continues to be rejuvenated with fresh faces, and a shifting demographic landscape is before us. New families and a new workforce have arrived, and it therefore the responsibility of the larger New Jersey community to better train, acclimate, and integrate these new Americans into the American fabric. For additional details, please refer to the recently published Eagleton Institute Study Report on “Crossroads of the World: New Americans in Middlesex County, New Jersey”.